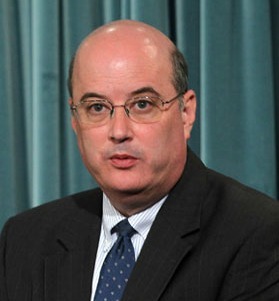 Michael Astrue, who previously served in the Social Security Administration as Counselor to the Commissioner, served in the US Department of Health and Human Services as General Counsel and as Acting Deputy Assistant Secretary for Legislation. He also served as Associate Counsel to the President of the United States at the White House in the Ronald Reagan and George Bush Sr administrations. In the private sector, he practiced law and was as a senior executive at several biotechnology companies. Astrue was nominated as Commissioner of the Social Security Administration by President George W. Bush on September 14, 2006 and confirmed by the US Senate on February 2, 2007. He was sworn in on February 12, 2007 to serve a six-year term that expired on January 19, 2013. After his secondary education at The Roxbury Latin School, Astrue earned a bachelor's degree from Yale University, where he served as President of the Yale Political Union, and a Juris Doctor degree from Harvard Law School. "Michael Astrue delivered for us. We had guests standing in line for hours waiting to speak to him. He spoke with everyone and stayed until the last person left the room. We had an educational and fun evening."